So, for a little while now, we’ve seen rumors and then brief snapshots of an Escape Room movie. Being the enthusiasts that we are, as well as loving a good thriller, we were a bit intrigued as to how the crew was going to take an escape room experience and turn it into a cinematic experience. The local DC rep from Columbia Pictures reached out to us to see if we’d be interested in attending the DC premier of the movie. Since we already promote reviews and games, and worked with the Solver team last year on their movie, we agreed spread the word. This movie opens in theaters on January 4. You find yourself in a room – no windows, only one door, and it’s locked. The madman who’s locked you in has set up a series of fiendishly clever and difficult puzzles that, when solved in the correct order, will lead to the key and your salvation. And to add to the difficulty, he’s set a ticking clock, with one hour to complete the puzzles and escape… or face the consequences. What sounds like a horror movie is one of the fastest-growing entertainments in the world: the escape room phenomenon. Armed with only your wits – and the variety of strengths of the people in the room with you – players have been cracking codes, deciphering enigmas, and unlocking hidden caches as quickly as they can. Each room has a secret plot, with players piecing it together as a fun, team-building experience. Since the dawn of the concept in 2010, escape rooms have popped up all over the world at an amazing rate by satisfying human nature’s hunger for fun and escape from reality. 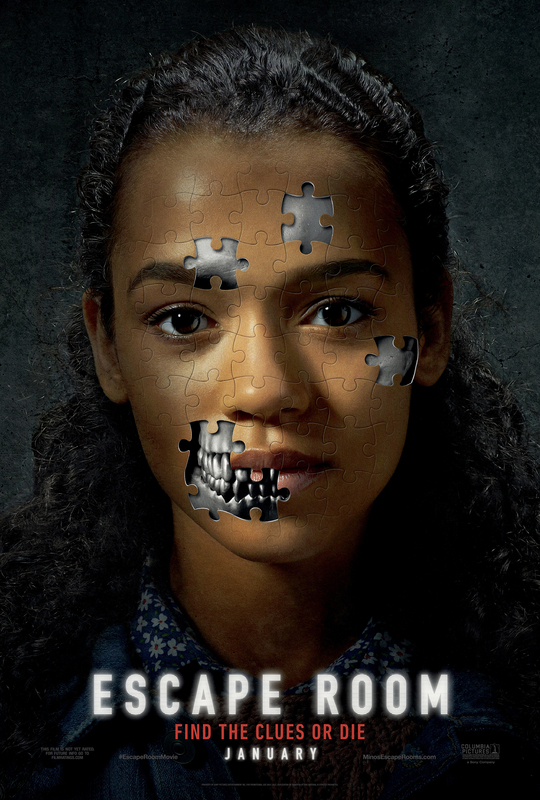 When producer Ori Marmur tried out an escape room with his family, he saw the potential for a film – and because audiences worldwide have embraced the concept, it could be a film whose themes had global appeal. “I thought it was very immersive and incredibly fun, sort of a living boardgame,” he says. The project seemed to be a natural fit with a classic locked-room mystery setup, and with producer Neal H. Moritz, he began to shepherd the project. 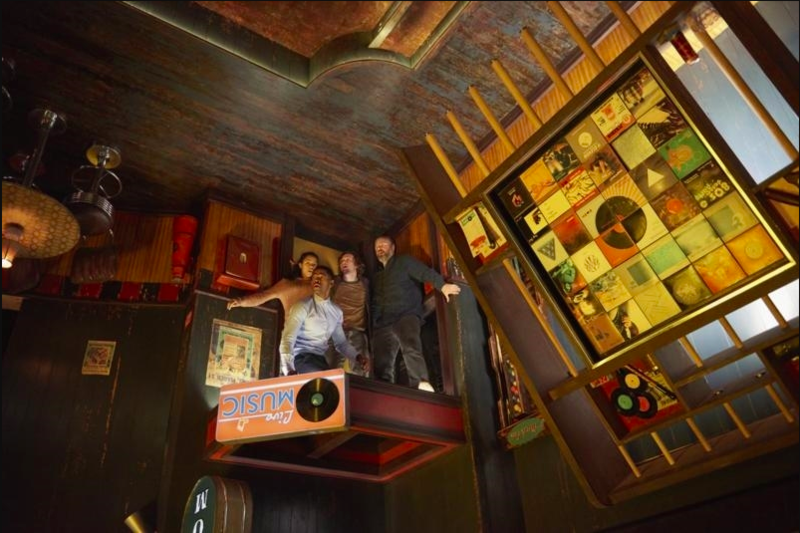 Quickly, they hit on a way to raise the stakes, making the ultimate escape room: one that is not only hyper slick and incredibly dangerous – when the clock runs out, it means death. We’ve done a number of rooms where a serial killer or madman has us trapped in their lab or lair, and we have to figure our way out before he/she returns. Now, we’ve even done a few rooms that had a “Saw” feeling with them, so the overall theme of the movie isn’t that far a stretch. What is interesting is that the room turns deadly AFTER the characters begin playing. From the looks of the trailer and the press packet we received, it simply looks like the six strangers have agreed to do a room together that is billed as the most immersive room yet, and has a $1 million prize for escaping. Let’s just hope none of them show up drunk or stoned (this has happened to us). As the experience progresses, they have to make their way through and figure out their own role in the game and how the rooms were specifically created for each of them… and not die in the process. We were pretty psyched to see that Adam Robitel, who directed Insidious: The Last Key also directed this one, so that brings some legitimacy to the movie being a true thriller. Stay tuned for our review of the movie. Check out and follow our social media channels below to be notified when new postings and interviews are published. Planning on seeing this movie? What are you most excited about? Comment on the post below and let us know! Rated PG-13 for Terror/Perilous Action & Violence, Some Suggestive Material and Language. Columbia Pictures presents an Original Film production, Escape Room. Starring Taylor Russell, Logan Miller, Deborah Ann Woll, Jay Ellis, Tyler Labine, Nik Dodani, with Yorick van Wageningen. Directed by Adam Robitel. Produced by Neal H. Moritz and Ori Marmur. Screenplay by Bragi Schut and Maria Melnik. Story by Bragi Schut. Executive Producer is Rebecca Rivo. Director of Photography is Marc Spicer. Production Designer is Edward Thomas. Editor is Steven Mirkovich, ACE. Music by Brian Tyler & John Carey.